King Arthur Unbleached All-Purpose Flour is perfect for bread machines. 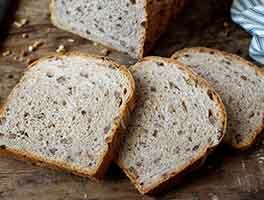 Its relatively high protein level (11.7%), and the quality of that protein, allows you to use it in recipes calling for either bread flour or all-purpose flour. 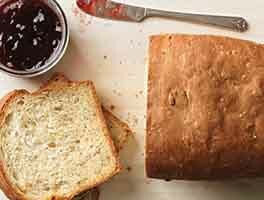 This recipe makes a reliably high-rising loaf, with soft, springy texture and nicely balanced flavor. 2 hrs 20 mins. to 3 hrs 25 mins. When the loaf is done, remove the pan from the machine. After about 5 minutes, gently shake the pan to dislodge the loaf, and turn it out onto a rack to cool. Wow, excellent loaf of bread, made dough in my ZoZo, baked in a 9 X 5 loaf pan. Wonderful loaf of bread, will bake again. This reminds me of the premium bread that you buy at the local market. 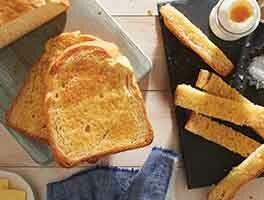 This bread was very light in texture and would be great for eating with pasta or spaghetti. The machine time was 2:45 (2 hours & 45 minutes). The recipe suprised me with only 2-1/2 cups of flour. Great recipe, though I found it too sweet. On a subsequent loaf I reduced the sugar to just over half and it was perfect. I made both the large machine and small machine recipe and noticed that the small machine recipe is not scaled down properly. Some of the ingredients are scaled to 2/3 while others are scaled to 3/4. That made the small machine recipe a bit too salty. I think the scaling issue was caused by trying to use common cup / spoon sizes rather than scaling by weight. For my use I started with the large recipe (reduced sugar) then created a few versions scaling by weight. I scaled to 75% for use in the Zojirushi, and 125% for doing 2 loaves in the oven. For the oven I think I'll have to either switch to 8.5" pans or scale up to 150% as the loaves were fluffy but a little short. I had the same experience as another reviewer. I used my older machine and the bread rose to the top. I cut that part off. It tastes really good! This is the first one lb loaf recipe I've found to come out perfectly in my machine. I'm a new bread machine user, and easy is important to gain confidence before I attempt to expand my repertoire on the machine. This fits the bill and makes just a real nice loaf. Definitely need a print option for this recipe. 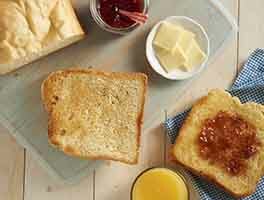 I am making this recipe as we speak, should I have just put all the ingredients in and turn on or should I have manually mixed it then placed it in the bread machine? 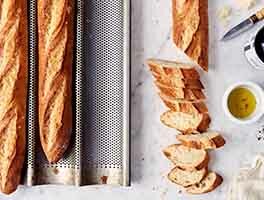 This is a great basic recipe for the bread machine. I find I can substitute 1/2 c. of flour for some other grain- oats, cornmeal, rolled barley, etc. Sometimes I switch the sweetener, too- brown sugar, molasses, honey. It always turns out great. Thank you, King Arthur!